When I was growing up in the 1960’s, my dolls looked a lot like me. Not exactly like me, because I didn’t have blue eyes or sun-drenched blonde hair. But they wore dresses, as I did, and their skin was white, like mine. Through a technological miracle, I could pull Chatty Cathy’s string, and she would speak short sentences in English. Back then, English was the only language I heard at home, school, or even on television. At the time, I gave little thought to diversity of any kind. The other boys and girls who lived in my post-World War II suburb were white. I remember seeing people with disabilities only in the grocery store or at church; they were almost always older folks who walked with crutches or a cane, such as my maternal grandfather. Shows that reflected more diverse populations, like Sesame Street, came after my childhood. I haven’t been a child, or even bought toys for one, in years. Throughout those years, parents and their children have lobbied toy companies to make dolls that reflect a wider variety of our world’s population. Thanks to advocacy by parent groups, dolls lining the shelves of toy stores today are more likely to have different features. According to Cosmopolitan magazine, British toymaker MakieLab allows kids to customize 3-D printed dolls in different sizes, shapes, colors, hair types, and abilities. For example, children can order dolls that have hearing aids or use walking sticks for mobility. Relatively recently, the Toy Like Me campaign on Facebook (#toylikeme) has called for greater “diversity in the toy box.” These parents envision toys that look more like and act more like their own children, many of whom have disabilities. A National Public Radio report notes this trend is not necessarily new. The American Girl doll line has for years offered doll accessories such as arm crutches, leg braces, a wheel chair, allergy-free lunch or a diabetes kit that includes insulin pumps, pens, glucose tablets and a blood sugar monitor. However, the trend appears to be accelerating, with more companies adding characters with disabilities to their toy lines. Furthermore, some manufacturers are expanding their vision of where these dolls might live or play. 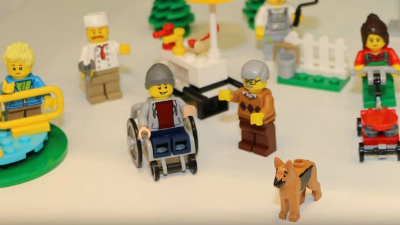 For example, Lego introduced a figure of a boy using a wheelchair. That character is sold as part of a city park set, playing at the park with other kids, rather than being associated with a hospital or physical therapy clinic. Significantly, manufacturing dolls with disabilities is NOT just about kids with disabilities feeling better about themselves when they can play with a “mini-me.” As the NPR story notes, Social Psychologist Sian Jones of Goldsmiths University in London and other researchers have found that ALL children benefit from playing with toys representing disability. The reason? Playing with such toys helps kids develop empathy. As an advocate for people with disabilities, I’m heartened by these changes. Now, children without disabilities might be more likely to understand their friends and family members who have disabilities. And the message will be transmitted to kids through the universal language of play. Molly Klocksin has been a Case Advocate at Disability Rights Nebraska for nearly 16 years. She holds a bachelor’s degree in journalism from the University of Wisconsin-Eau Claire and a master’s degree in counseling from Doane University, Lincoln.